Doesn anyone know which Bachmann HO locos have RP25 wheelsets? How about the 4-8-4 in the "Overland Limited" set? Must be an F9. I suppose the other one is too. Assemble the curved track in a circle. Measure the circle. If it is about 27" in diameter, then you have O-27 track. With their crimson and silver War Bonnet paint scheme, twin locomotives move with seemingly unstoppable force as they haul freight up and over towering mountain passes you create with this set's 14-piece graduated pier set. Raising a cloud of sparkling dust in its wake, the Silver Streak races to the horizon. I have an older IHC 2-8-2 that I modified a bit. I agree with Bob. They are good value and easy to work on. Is the loco dragging on straight track? curves? over turnouts? uncoupler ramps? or where? Maybe there is a prpoblem with the loco's wheel bearings and it is sitting too low? I have seen this with Atheran's where the bronze bearing is not sitting in the slot properly. My MDC 0-6-0 has a large axle gear that will contact any uncoupler ramps that are not perfectly installed. 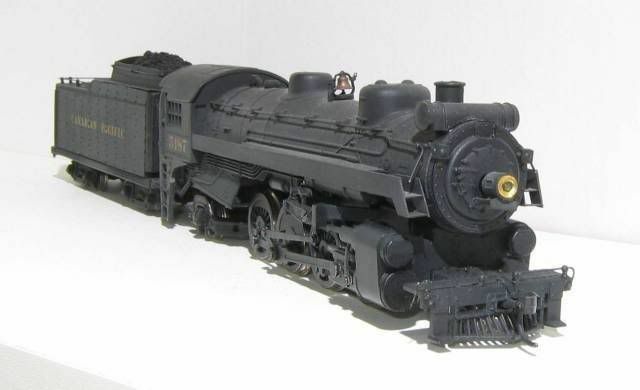 My last project was kitbashing an IHC 4-6-4 into a 1930's era CNR 5700. But if they ARE insulated route selective, then Vinny's only problem is that he has his feeds in the wrong position. That would greatly simplify the solution. If so then he only needs to have insulators to separate the inner and outer ovals for 2 train operation. Vinny, here is the diagram once more, but this time your inner oval feeder is removed because it was in a bad spot and required extra insulators. 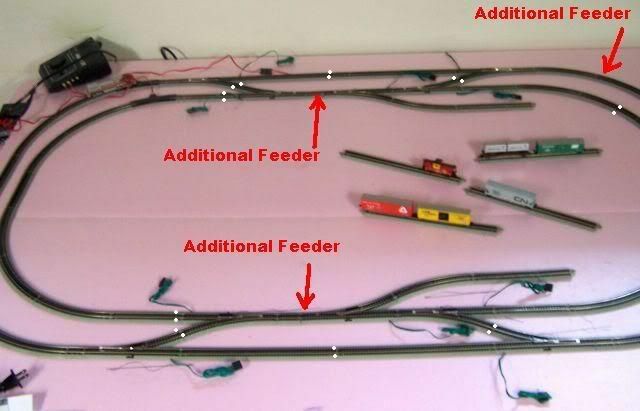 Vinny, I did some research and found out that Bachmann N Scale EZ Track turnouts are indeed . "Route Selective". You have some flexibility in where you put these insulators and feeders but you can follow this example and it will work. Just remember that the feeder wires must only power the points end of the turnout. If you study this diagram you will see that the electrical power will always encounter insulators so that there is no power to the diverging end of the turnouts. I don't believe that Bachmann EZ Track turnouts are "Power Routed" or "Route Selective". 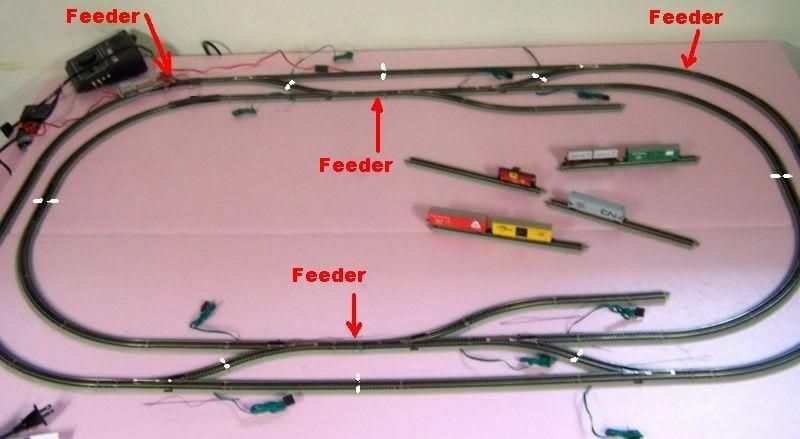 BUT IF THEY ARE then you must insulate the turnouts at both the straight and diverging tracks, and then you must add extra feeders to various parts of the track. The rule is that you can only feed power to the end of the turnout without the diverging tracks. The other ends must always be insulated or there will be a short circuit at the frog depending on which way the turnout is selected. I still can't believe that Bachmann would sell EZ Track turnouts that are "Route Selective". ROUTE SELECTIVE TURNOUTS ARE NOT FOR BEGINNERS!!!!!!!!! If your train runs on either oval then what is your problem?